"I have a Polaroid back for my Holga," says Rick LePage. The back costs 3x more than the Holga itself, and I'm still perfecting exposure with it since the Polaroid film ISO is different than what the Holga is set up for. But the images this combination produces... well, they're something else." But today we're talking about one of Rick's favorite types of media: Polaroid film. Rick rediscovered Polaroid photography recently when he found an SX70 in good shape. It's one of the cameras he grabs on his way out the door everyday, and he's captured some great images with it. 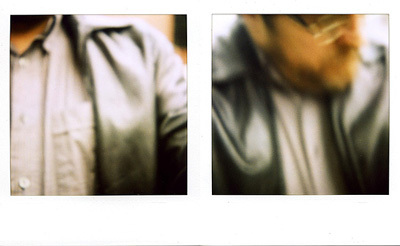 Then he discovered that you can mount a Polaroid back on a Holga, and his Polaroid experimentation broadened even further. In this podcast, Rick talks about his passion for instant photography and the process he uses to take images from camera to his flickr site. It's a terrific interview that I'm sure you'll enjoy. Polaroid self-portrait at top of page by Rick LePage. I also discuss this month's photo assignment, Slender. You can read more about how to submit on our Submissions page. i throughly enjoyed this podcast, because just about 3 days prior i had come across a beautiful 1969 Polaroid 350 Land Camera, and it still had the original manuals, cold clip, strap etc... I love my polaroid and i will now and then take pictures with it. (not alot, because the film is icredibly expensive, about $1.50 U.S Dollars a shot!) I love the idea of a polaroid back on a Holga, and will look into it. thx for finaly doing something on Polaroids, and mabie we should explore differnt photography formats more often. This theme is developed wholly. Well done!